Why should I acquire an artificial limb? Will I be able to use my artificial limb in the same ways I use my natural limbs? Do you fit patients for mastectomy products? What type of braces do you manufacture and fit patients with? 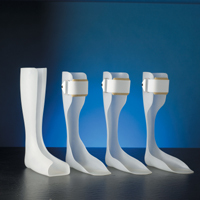 Do you manufacture custom-made foot orthotics? 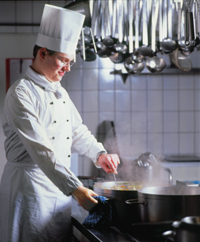 Why should I choose APOS? I do not live near one of your offices. Can I still be a patient? An artificial limb can greatly enhance your life after an amputation, for patients with all levels of amputation. This includes amputations of the legs or arms and partial amputations of the foot or hand. If you have had a lower limb amputation, either above or below the knee, you are limited to moving with the assistance of a wheelchair or crutches. However, if you use a prosthesis you can gain complete freedom from these devices or possibly depend only on a cane or walker, depending on your circumstances. 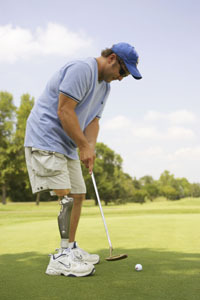 With your artificial limb you can move freely and comfortably again. In addition to the functional benefits, wearing a prosthesis can give you more confidence in social situations. While many patients are beginning to "show off" the high-tech components in their prostheses and choose not to have a cosmetic protective cover, covers that are shaped like the remaining leg are still quite popular. Whether you choose to have us finish your prosthesis with a special fabric, pattern, or color of your choice, or you choose the more cosmetic option of a leg-shaped cover, we can meet your preferences. If you have an upper extremity amputation, either above or below the elbow, you can also benefit from a prosthesis. 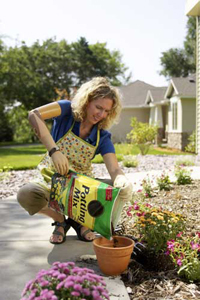 You have several options depending on what functions you desire your prosthesis to provide. The most basic is a passive prosthesis, shaped like your remaining arm and hand, providing a cosmetic enhancement. This prosthesis has no moving parts, but a passive prosthesis will help you regain function by allowing you to brace objects against it for assistance in picking up and moving items. Other prostheses allow more movement, including those with a traditional hook gripping device, controlled by a cable, as well as the more advanced myoelectric prosthesis, controlled by the muscle contractions that remain in your body. The myoelectric prosthesis also allows for more cosmetic enhancement, as its gripping device is shaped like a hand. We also make prostheses for partial foot and partial hand amputations. If you have had part of your foot amputated you can benefit from a partial foot insert. This prosthesis takes up the space in your shoe that has been left empty and it will give you a lever to roll over as you walk. Even if you have had just a couple of toes amputated, you can benefit from a toe filler. When you walk, your foot acts as a lever arm to roll over. Your amputation has shortened this lever arm and you experience a drop-off as you walk. A toe filler alleviates this problem. This prosthesis looks like a foot orthotic but fills up the space where your toes once were. It is built on a full footplate, which gives you a complete lever arm again. Both of these will make walking easier for you as they allow energy return so you can use less or your own energy as you walk. If you have had one or more fingers amputated, we have several options for you, as well. Depending on which fingers have been amputated, you will have different needs, which can be fulfilled with a prosthesis. A partial hand prosthesis will return a significant amount of function as the replacement of your fingers will once again allow oppositional movement for grasping. No matter what level of amputation you have you can receive benefit from wearing a prosthesis. When you visit one of our prosthetic practitioners, he or she can explain to you the different options available to you and help find the best fit to your lifestyle and what you want to be able to achieve! In many ways, the answer is yes! When you come to our office, our goal is to help you "become as active as you once were." 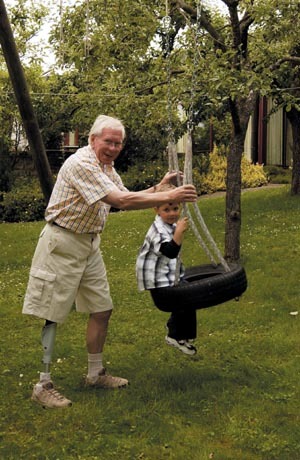 While a prosthesis can never completely replace your natural limb, it can allow you to do nearly everything you were able to do with your natural limbs, depending on the level of amputation. In lower limb cases, patients with amputations below the knee do very well and have the least amount of difficulty in returning to their former lifestyles. Patients with amputations above the knee proceed more slowly and with more work, but in nearly every case can return to their former lifestyles. Patients with upper extremity amputations have varying degrees of success, depending on their desires and specific needs from their prosthesis. It is possible to return to a very high level of function, though it takes patience and hard work. In all cases, use of a prosthesis should be attempted...the benefits are substantial if success is achieved! The key to success is ATTITUDE! 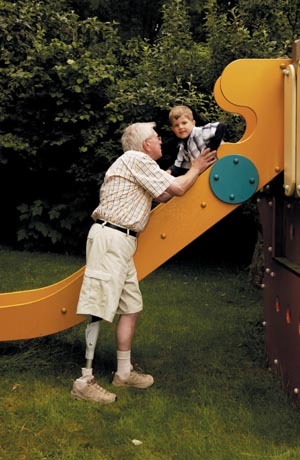 If you have the desire, will, and motivation to make your prosthesis work for you, it will! It may be a tough road but you will be pleased with the results as you continue to regain more freedom. Yes. We have an in-office fitter who is available on an appointment-only basis. Call today to make an appointment! Yes, our foot orthotics are made on-site by our qualified practitioners and technicians. 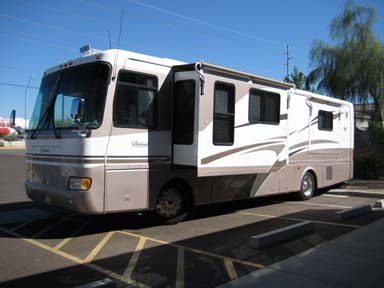 We are contracted with various insurance companies. Please contact us today to see if we can accept yours. At APOS our greatest concern is for you, our patient. We are dedicated to finding new ways to serve you and ensure that you will continue to receive the highest level of quality care from us through the years. As a family-owned and operated facility we pride ourselves on the amount of time and attention we can devote to our patients; you will never feel rushed in and out of our facilities, and will be pleased by our attentive staff and practitioners. Our prosthetic practitioners are certified to fit the most state-of-the art devices, as well. These include the C-Leg by Otto Bock, the Proprio Foot by Ossur, and the Harmony vacuum system by Otto Bock. Knowing that your practitioner has these options possible you can be sure that your practitioner will be able to make the most appropriate fitting choice for you. Both our facility and staff are certified by the American Board for Certification of Prosthetists and Orthotists (ABC), the standard of education and excellence in our field. Our staff has many years of experience in the prosthetic, orthotic and rehabilitation fields. We are committed to education, as well; our Residency Program is accredited by the National Commission on Orthotic and Prosthetic Education (NCOPE). Our residency program allows us to train our future generations of prosthetists and orthotists, from the beginning, to meet our rigorous company standards. Yes. If you live in an outlying area of one of the cities where our offices our located and you cannot come in to our office, we can offer our services to you via our mobile lab. This service is available on a case-by-case basis, so please call our offices to see if we can schedule a visit. Have your heard your practitioner use a technical word and you weren't sure what it meant and were too shy to ask? While we want you to feel free to ask us for clarification at any time if we say something you do not understand, in the meantime we have provideed a glossary of terms for your convenience. Click here for the glossary. © Arizona Prosthetic Orthotic Services. All rights reserved.